PROBLEM: Paying for services that should be included. 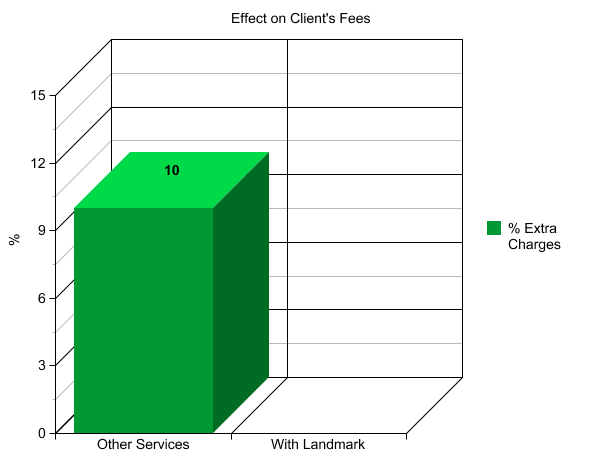 Many billing services charge more for electronic insurance filing because they have to pay more fees themselves. CAUSE: Some Billing Services Bill their Clients Extra for Telephone Charges, Postage, Forms, Supplies, etc. Paying extra for these services is similar to giving one’s billing service a ‘blank-check’ for them to fill out. Many billing companies quote a competitive fee to obtain an account and then add these extras on top making the original arrangement more costly for the client. Some charge more to turn over delinquent accounts to collection. REMEDY:	Landmark and the client agree on one commission fee for all of the required billing work. No hidden or extra charges appear. The client knows exactly what percentage of the receipts he or she will be billed each month. Charging for each insurance claim filing only benefits the billing company. They charge for each and every filing: primary, secondary, tertiary, and re-submitting insurance rejections. 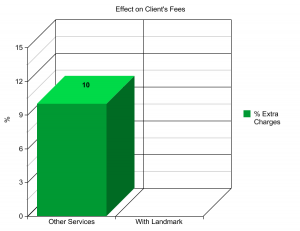 The client then pays multiple fees for one claim and has to pay another fee for resubmitting a rejection even if it was the billing company’s mistake. Most Employees of Billing Departments and Companies Receive their Wages on an Hourly Basis Regardless of Performance. Paying employees the same amount whether they process four or eight claims per hour results in less work being done per dollar spent by the client.